Just the thought,' Am spending a couple of weeks in London" brings on different images in everyone us. Whether it be Buckingham Palace, Big Ben, the Tower of London or Trafalgar Square - they are all pretty aweinspiring. Or to the likes of David, catching a show on the West-end, promenading at the Royal Albert Hall or memories of being amongst the 100,000 at Wembley Stadium rocking his little brain out to the Rolling Stones. But these last two weeks were a little different. 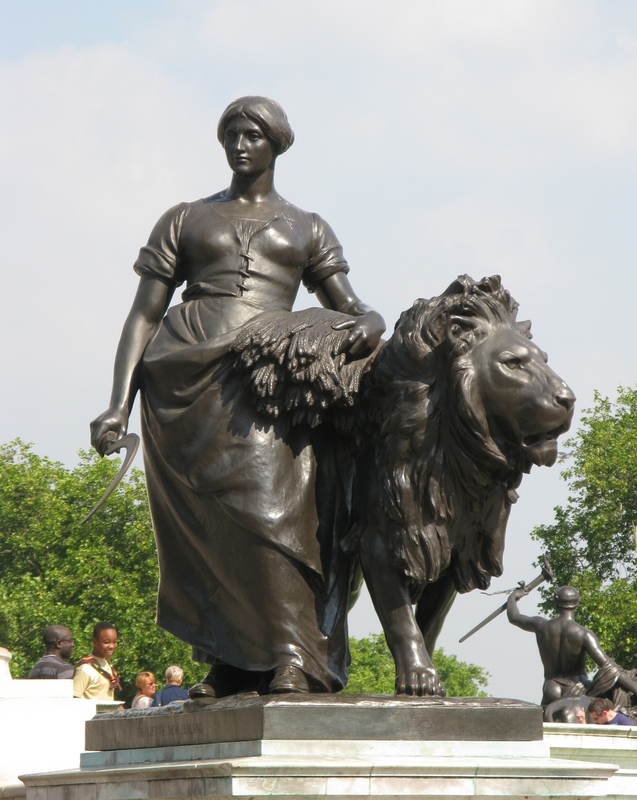 Above are a couple of statues outside Buckingham Palace that could be of us this week. We're here lucky enough to be Housesitting in Fulham, so that initial pain of an inflated priced hotel room has been swept aside but with that goes the price of freedom!! Not quite that bad but it does mean we are a little restricted as to how long we are both away from the house. But we can do a tag team scenario so all is not lost and often surprised just how much country we can cover in three hours. Procuring an Oyster card and getting up to speed with the London tube system is an entertaining scenario. God I love public transport but easier to sort out when not in the midst of rush hour with thousands of passengers squeezing themselves into a fast moving carriage that waits for no one. Squashed up like sardines, all a bit smelly from a long day at work, wet from the persistent Spring showers, brollys sticking into people and following the unwritten rules of train travel - no making eye contact and certainly no talking to anyone. How many millions of dollars worth of technology is being used on these trains, which assures you don't break any of these rules. Another bonus of being right here amongst all the action in London central, meant that we were able to meet up with some old friends from NZ. Tim, Sally and Bid were just back from a month in Europe, full of the joys of life and some wonderful traveling stories. Such a great sense of camaraderie that is shared by travellers no matter what your age. They were making the most of the High street shops and endeavouring to fill the suitcases and thrash the visa card before they departed. We discovered a charming French Perfumier in Fortnum and Mason who had a reputation of never selling you anything unless he approved that it was the perfect scent for you. So we were putty in his hands as he went through the process and even had the coffee beans on a little sliver tray for us to sniff before we tried each scent. Once choosen, he applied it to the skin, but wouldn't let us buy then and there. We must leave the shop, let it settle on the skin for at least thirty minutes ( none of that 'closing the sale before you leave' attitude here!!). No talk of price at all. So here I am at home five hours later, still consistently sniffing my wrist, thinking this smells wonderful. Only to discover on line that a small bottle of this Xerjoff perfume cost anywhere from £250 to £10000's!!! But such a fun bit of indulgence on a wet afternoon. Drinks, dinner, and some lovely strolls with Rosie, an old school friend who lives literally ten minutes walk away was such a treat. We couldnt have planned it better as had so much to catch up on after not seeing each for years . David got introduced to the meaning of a 'boys lunch'. He met a couple of mates in Pimlico for what he thought was a casual bite to eat over a beer or a glass of wine. Little did he realise that a 12.30pm start doesn't mean 3pm finish. In fact it was 11.30pm when he received a text from the ringleader declaring that he had just made it to the train and was finally heading home.. Somehow David had slipped out of their clutches, while still sane of mind and sauntered back home along the river. Not sure the wallet or the liver could have taken eleven hours of socialising with those two - knowing they were ex pub men should have been enough of a red flag for him. Walks along Putney Bridge, the embankment and just strolling along the Kings Road into Chelsea or Fulham High street, it's all new and fun to be amongst the buzz of this vibrant city. Even the Charity shops take you to a new level. What do people in in these very smart areas of London do when they're tired of the their lovely new clothes?? Yes of course, they clean out their wardrobes regularly and drop it off at the closest charity shop and don't give them another thought. It is their donation!! But for a wily traveller like myself these shops have proven one of the most fun, least expensive forms of entertainment throughout the country. When you've lived out of one (large) suitcase for the last three years, you start to see the same clothes coming out on a very regular basis, and appearing far too often in photographs so thats where Charity shops step in. They say 'it's all in the chase', but this time 'it's all in the hunt' and I delight in finding some beautifully made, high quality, nearly new, gems for next to nothing. A smart , savvy, well dressed traveller and doing my bit to contribute to the many worldwide charities!!! Time for another stint back out to the country and this time we're in the glorious Somerset countryside with some delightful four legged friends. Take a deep breathe of country air and prepare for some real excitement in Morocco.